Submit your order . . . Sorry we don't ship outside the USA at this time. 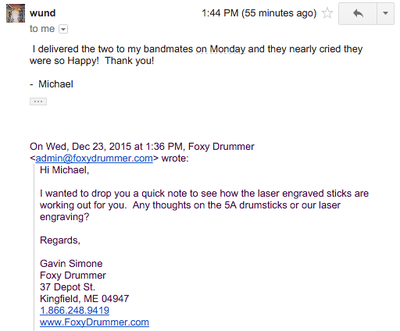 Ever wonder how we engrave the drumsticks? 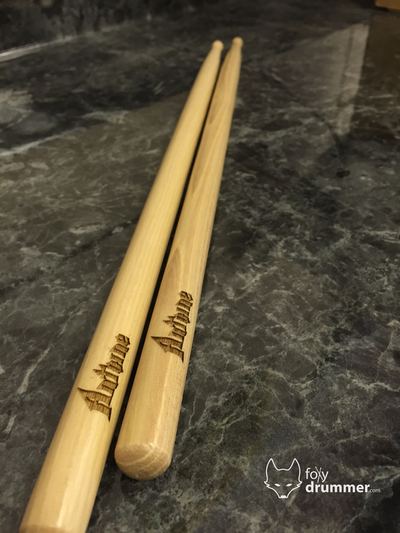 Look below to see the last 10 people who came here to buy their laser engraved drumsticks this season. 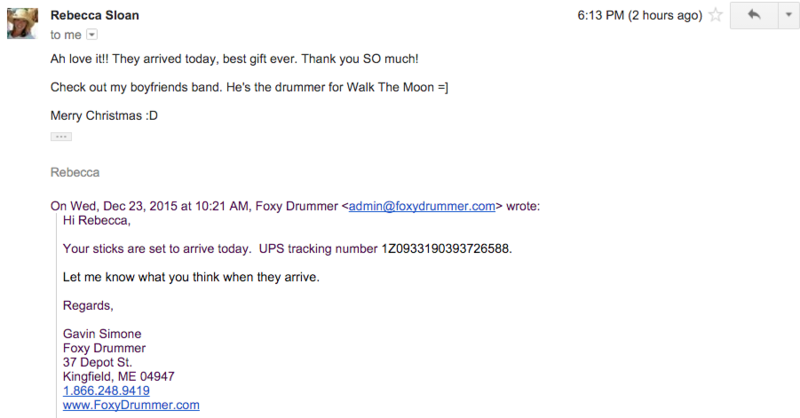 You're in good company and this gift never disappoints! 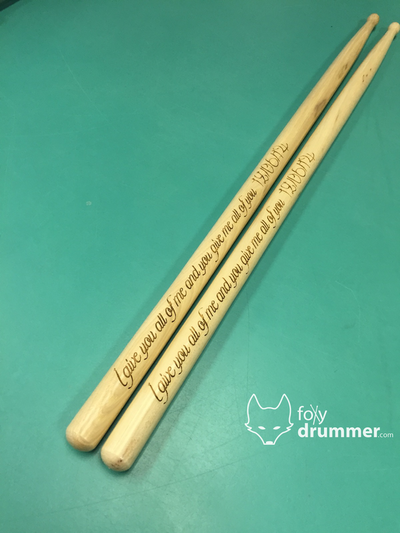 These laser engraved drumsticks make the perfect holiday gift for that special drummer in your life. We can engrave up to 50 characters per stick. Shown here is about that limit. 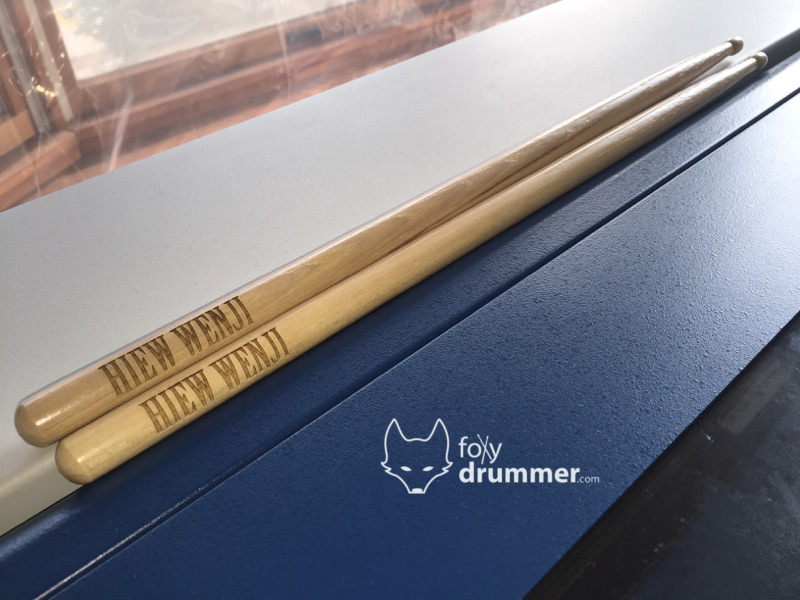 Engraved a drummer's name for a perfect birthday gift. Q1. Is your payment secure? A1. Yes. 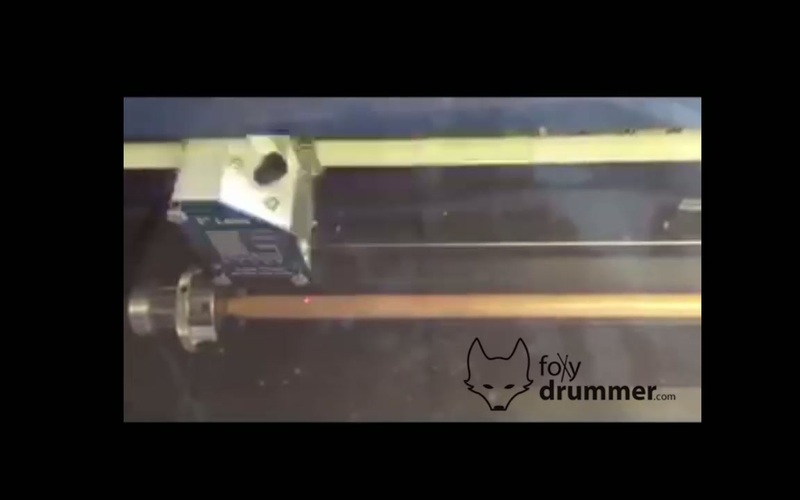 PayPal encrypts your credit card information and does not share it with anyone, including Foxy Drummer. ​Your checkout is on a secure https page for added security. Q2. 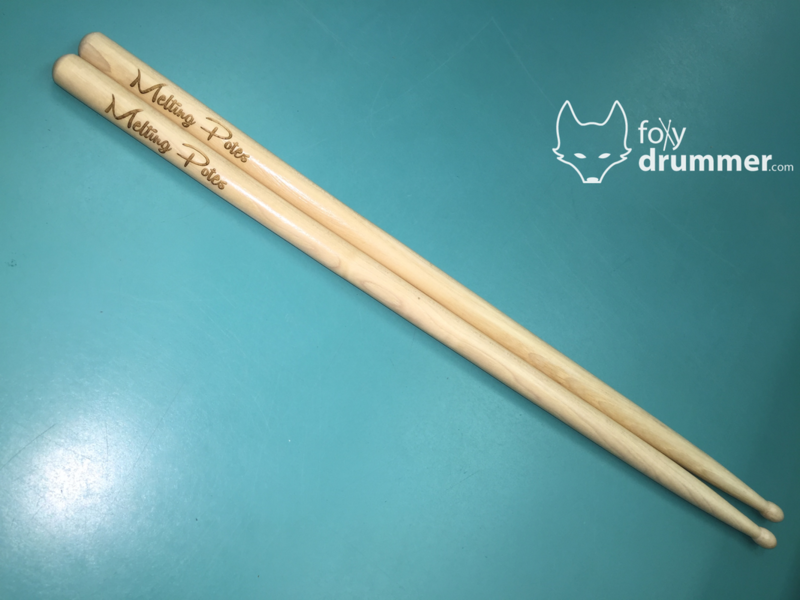 What stick sizes are available? A2. You can choose from 5A (average size), 7A (our smallest) or 5B (our largest). All have wooden tips and are guaranteed to be straight. Q3. How much text can I include on the sticks? A3. Up to 50 characters. An example of that is: "Happy Birthday John Smith my wonderful son-in-law". We'll that's actually 49 characters but you get the idea, right? 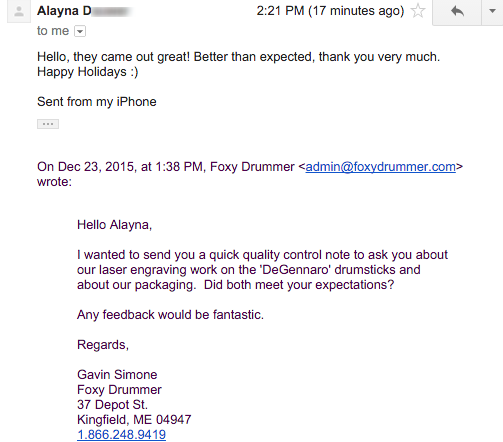 We'll email you back after you have placed your order if you put too much text down. Most people are way under the 50 characters. A4. Unfortunately no. We can only engrave your text at this time. Please select one of our 6 fonts. Q5. Can I have a different message engraved on each stick? (stick 1) Happy Birthday Justin (stick 2) We love you! Q6. 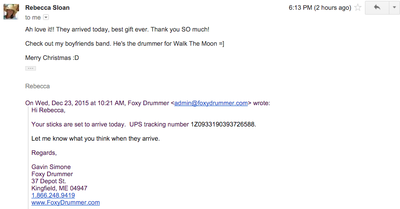 How long will it take to receive my sticks if I order today? Production: 3 business days + Shipping: 2-5 business days (mainland USA); 5-8 business days (Canada and USA other); and 1.5 to 2.5 weeks (International). A7. Yes. Here is the process. Select what you want for your first pair in the form above (the size, font and text you would like engraved). Then click the 'Add to Cart' button. You'll be taken to a checkout page. Here is the trick. Click the 'Continue Shopping' button. That will take you back to this page and you can add the details for your second pair. Simply repeat that process for each pair that is going to have new text on it. Then you are ready to place your order. Q8. 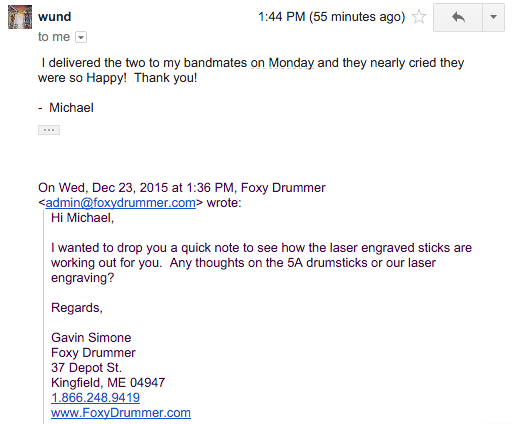 WHat happens if I don't like the engraving or sticks? We stand behind our work. However, if you are not happy, then we are not happy. After you receive your order, let us know within 7 days if it does not meet your expectations. We'll give you a full refund and then pay for shipping back to our shop so we can see what went wrong. Q9. Do you have any reviews I can see? Sure. Here are a few and much more coming! Q10. 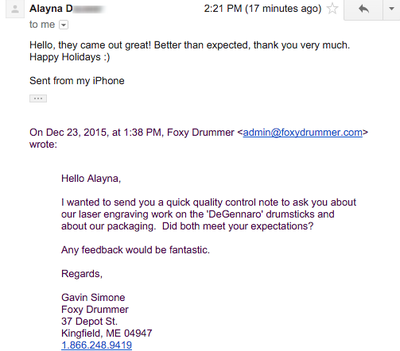 WHY ARE YOU GUYS SUCH AN AMAZING COMPANY? 2009-2016 Copyright, Foxy Drummer. All Rights Reserved. UPS® and Shop Small® are registered trademarks of their respective owners.